It's difficult to put into words what my military kids mean to me, and I'm sure you can relate if you have your own children. While they didn't choose this life, don't get asked if they'd like to move again or deal with separations from their parent, they can still somehow manage to be an example to us of coping and adapting. One of the things that's always surprised me about my kids facing a new military life challenge is how they can manage to create fun and adventure in the midst of it. Another moving day? It means empty rooms in which to rough-house or throw a ball around. New neighborhood? There are parks to explore, bikes to ride, and neighbors to meet. Living in another country? Time to pull out the foreign language app and order new food! I've written before about lessons I've learned from my own military kids, so as I'm thinking of ways to honor and celebrate military kids this month during the "Month of the Military Child," I've turned to some of our blogging friends for inspiration and ideas. 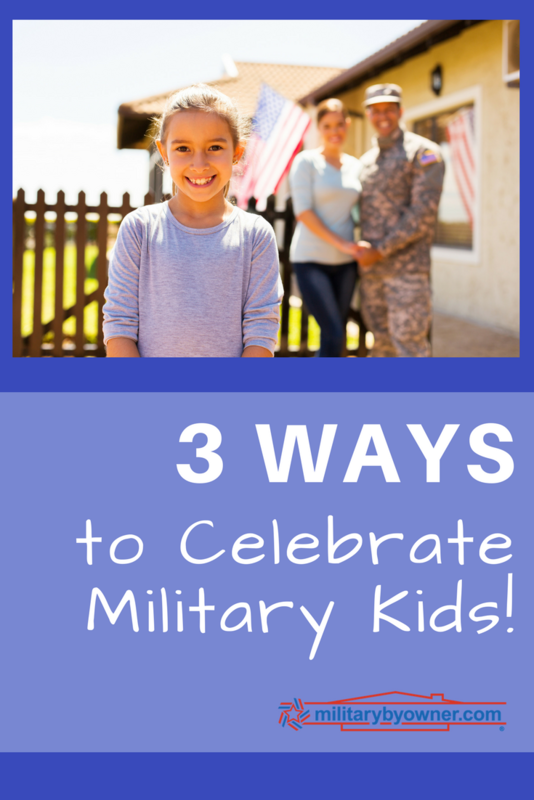 How will you celebrate your military kids this month? 1) Purple Up for Military Kids! "Purple Up! For Military Kids" will be celebrated across DoDEA during the week of April 8 - 13. This is the time for DoDEA Communities to wear purple to show support and thank military children for their strength and sacrifices. Purple symbolizes the combined colors of all branches of the military-Army green, Coast Guard blue, Air Force blue, Marine red, and Navy blue. Follow along or share a photo of your local celebrations on the DoDEA Facebook page. New mom Janelle from Come Fly With Us reminds us that the term brat doesn't have to be derogatory. To her, the phrase military brat stands for Boldness, Responsibility, Adaptability, and Tolerance. Jennifer Lambert from Raising Servant Leaders says that these Third Culture Kids learn to weather transitions and fit in quickly. Let's not forget our neighbors and allies to the north, where Canada is also celebrating their military kids this month. She is Fierce reminds us there's no such thing as an "average military kid' in Canadian Military Kids in April. Have you heard of the "Hoffman Squadron," America's first military quintuplets? They give new meaning to the phrase military brats with their "quintuplets + 2"! Follow along with their adventures on their Facebook page. My husband regularly remarks on our son’s lack of interest in superheroes, but it doesn’t surprise me in the least. Every day he sees what service looks like when it is lived. We have family friends who have been injured and killed in action. We bring meals or leave gifts to someone struggling with a deployment. He watches cars pull to the side of the road as soldiers render honors to the flag during Reveille and Retreat. He is growing up with gaggle of quasi-aunts and uncles who help to celebrate birthdays, clean the house before homecomings and share dinners over Skype when our loved ones are away. Before he finishes elementary school, he has learned the most important lesson it took me years as a military spouse to absorb: that relationships – marriage, friendship, professional – take work and investment to sustain. If he takes only that away from our time as a military family, I’m confident he will come out ahead. Meg Flanagan of MilKids suggests 5 Ways to Celebrate MilKids in April, and reminds us of the fact that military kids may be flying under the radar where you live and are usually in the minority. If the community is aware of what this month is about, they would be more likely to help celebrate military kids and help them feel special. This will continue on through the rest of the year and can make for a more supportive community year round. And, finally, take a look at this video created by Humans on the Homefront, with an absolutely precious narration from a 6-year-old military kid (Note: tissue alert!). Thanks to your military kids, this month and always!